These PDFs can be used in September to celebrate National Grandparents' Day with your students. In the USA, this holiday is celebrated on the first Sunday after Labor Day. 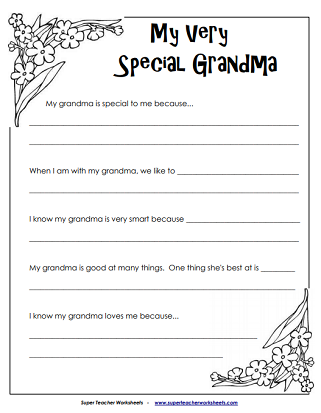 On this page, students tell why their grandma is special, what they like to do when they are with grandma, and why they love their grandma. Kids can write why their grandma is special on this award certificate. 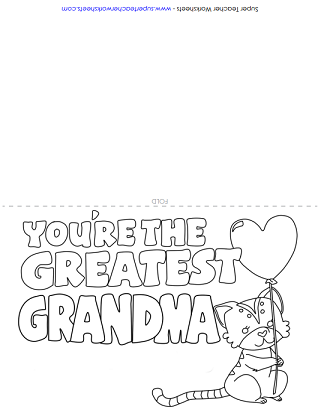 Color and fold this cute card and write a special note to grandma. It has a picture of a kitty holding a balloon. This card has a picture of flowers, and the words "I love my grandma!" on the front. 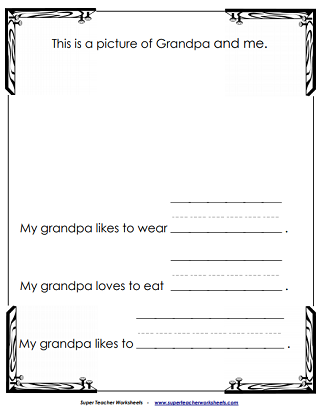 On this page, students draw a picture of their grandpa. They write about him and, at the end, tell why they love him. This file has primary-ruled lines. Kids can write why their grandpa is special and present him with this award certificate. Kids can color the front of this card, and write a special note to their grandfather on the inside. This card has the words "I love my grandparents" and a picture of Grandma and Grandpa holding up a young boy. Students can color the card and write a special message. Color and fold this Grandparents' Day card. There's a picture of a grandma and grandpa holding up a young girl. STW has printable resources for most major holidays, including Father's Day, Mother's Day, Halloween, Christmas, Thanksgiving, Valentine's Day, and more. This page has printable fall crafts, blank calendars, fall/autumn math worksheets, and more.